Discover how Predictive Analytics can integrate with data visualization and how this applies to the way we learn. Doug Cogswell, CEO/President, ADVIZOR Solutions, Inc.
ADVIZOR leads the way with Data Discovery and Analysis solutions. We access, blend, and synthesize data from multiple sources -- including the Internet of Things. We present results for analysis in extremely interactive visualization dashboards. 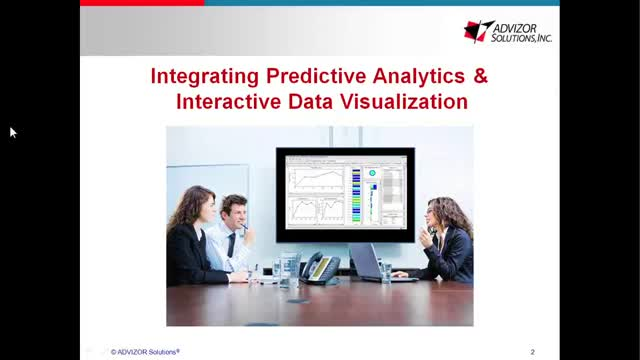 Our analytics includes built-in no coding predictive modeling. We offer full solutions for Cyber Security, Manufacturing, and higher education and healthcare fundraising. A three minute summary of ADVIZOR's unique data discovery and analysis products. Covers data access, blending, synthesizing, building models, and deploying out interactive visualization dashboards to departmental and enterprise teams.